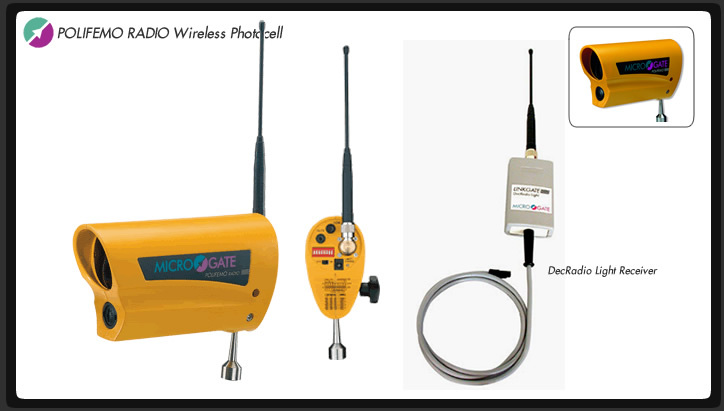 Microgate's Polifemo Radio wireless photocell offers most of the benefits of the Standard wired photocell plus the added luxury of high-security wireless transmission. The self-contained transmitter means no messy external radios or cables, which in turn makes setup and removal that much faster. The system's digitally coded signal and onboard controller allows you to individually identify up to six intermediate times. The Polifemo cell family employs a coaxial optic system guaranteeing a line width of over 35m when used with a reflector or up to 90 metres with a separate transmitter/receiver. Also available in the even more affordable Radio Light configuration, with all the features of the regular model but with a decreased transmission range of approx. 300 meters (1000').